This week, based on the readings and discussions, I found myself drawn to more curricular based research. I wanted to find where I could possibly fit these ideas into gym classes, but also how I could help teachers connect students to the culture. The cultural biases and equality discussion also made me think about how this related to the physical education aspect of my research and I wanted to touch on this as well. I decided after a very interesting pro-d day that focused on first nations representation in our curriclulum on how this physical education piece could possibly fit into the first nations cultural views. I first looked on our British Columbia new curriculum website and found surprisingly nothing. I did however, start to get creative and looked at the positive personal and cultural identity section. Much of the dances I would be teaching should enhance the idea that everyone is unique, yet also connected. This is not necessarily a dance inspired resource, however I would like to include it in my website as a tool for teachers looking to use first nations influence in the gym. This website is extensive and while not based in BC has some fantastic ideas for using first nations ideals in the gym. There are options for primary, intermediate and older. Use of animals is definitely highlighted and is a wonderful way to inspire gross motor skills, I use this daily regardless of whether it is culturally significant or not. I also decided I would delve more into the health aspect of the first nations culture, possibly as a motivator for teachers to insert culture into their gym classes. Health statistics for first nations people are very interesting and should serve as a useful tool for teachers. Specifically page 27, which highlights physical activity and food consumption. Interestingly the majority of first nations peoples (35% of men and 26% of women) were physically active for 60 minutes per day, a statistic I feel could be higher. Unfortunately, there are no statistics for children in these families, however, physical education as youth could help increase physical wellness in adults. Also interesting was table 3 as it highlights resiliency seen in first nations students and the graduation statistics among them. This doesn’t necessarily relate to inspiring physical wellness, but should be a motivator in introducing culture and personal cultural identity. That sense of community would hopefully help first nations students be motivated to complete their degrees and excel in school. 4. This week’s readings and discussion had me thinking about cultural stereotypes and how first nations people are viewed in terms of physical health. Unfortunately first nations people have not been as active in, say, the sports community as would other cultures. However, I think looking at this image the outdoor education aspect is something to be emphasized. Fishing and hunting are all forms of sport and allow for some physical activity to take place. Field trips or walks in nature would be an excellent cultural activity to complete as a part of gym class. While this is not necessarily dance related as I had hoped, I think it is important for teachers to touch on all ways first nations people are physically active and make it a point to convey this to students. Since the culture is so rich and often viewed in one way, students need to learn how cultural stereotypes come to be. 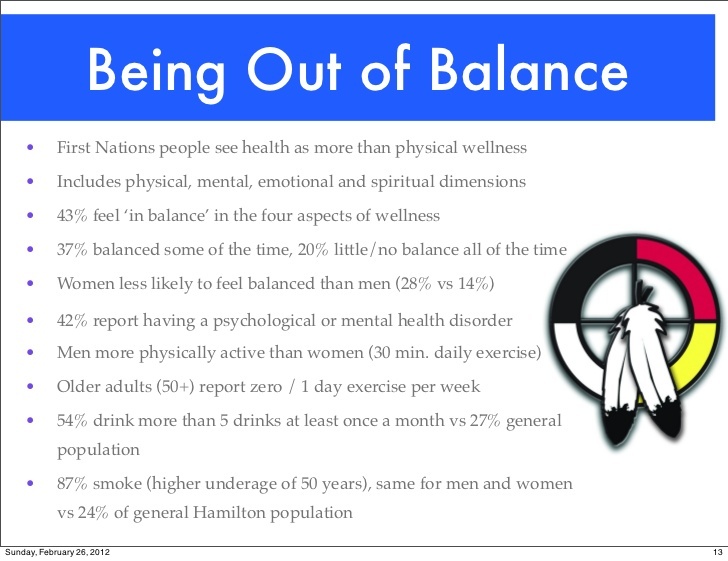 I stumbled across this slideshow on this linkedin profile which was based in Hamilton and was titled an Urban Aboriginal Health Database Research Project. The image was the one I thought would be beneficial to my research. 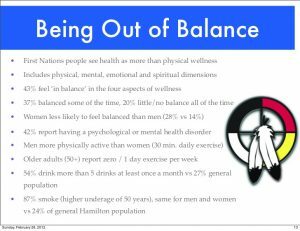 It is important to note that physical wellness, while important to first nations people, is not necessarily what makes one healthy. Considering this, there would be great crossover lessons available to emphasize the mind-body connection so important in first nations culture. To me even practicing deep breathing could be beneficial physically, while at the same time emphasizing wellness. Yoga would be an excellent example and lesson to do as it does incorporate animal poses, something important to first nations culture. The mind-body concept would be an excellent starting off point for teachers of both younger and older students. According to the Canadian Institute of Health Aboriginal Youth are five to six times more likely to commit suicide then non-aboriginal peers. So the Maclean’s article on Bella Bella titled, “The Town that Solved Suicide” is attention getting. Bella Bella was able to give everyone, including the youth of the community, hope. Hope that the future would be brighter and there would be ways individuals could contribute to the community and economically to their families. Lot’s of research has been done on suicide rates in Indigenous Communities, is there research on what communities can do to stop this? Are stories of these successful communities shared online with other communities? 1. I found this website interesting from the perspective of an educator who would like to give students in the classroom an overview of the First Peoples of Canada. This virtual exhibition provides information about the different societies, languages and population percentages and distribution in Canada, before moving to “An Aboriginal Presence” which gives a short biography on many notable Canadian Indigenous peoples, including Alwyn Morris, a gold and bronze Olympic medalist, and Buffy Sainte-Marie, who co-wrote a song I loved when I was younger titled, “Up Where We Belong” among many others. Included in the virtual exhibition are traditional knowledges and artifacts, as well as origins and archaeology. While the exhibition provides more information than an educator might want to show students (it takes quite a while to read through all of the materials presented) I think it has the potential to be a valuable resource in the classroom. I personally enjoyed the sections “An Aboriginal Presence” (as it gave brief biographies of notable First Peoples) and “We Are the Land” (both knowledge and experience) the most. 2. 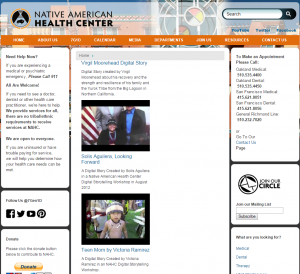 The next link is to the “Anishnawbe Health Toronto” website. I am including this website because during a previous weblog entry (Module 2 Weblog, link #3), I found an article by O’Sullivan (2013) titled, “Considering Culture in Aboriginal Care” (link: http://m.cmaj.ca/content/185/1/E27.full.pdf). O’Sullivan’s article highlighted the difficulties encountered by Indigenous patients in the Canadian health care system including a lack of feeling of safety, acceptance, empathy and respect. In contrast, Anishnawbe Heath Toronto appears to do the opposite by providing a community health centre based on traditional Indigenous knowledges and traditions; “AHT offers access to health care practitioners from many disciplines including Traditional Healers, Elders and Medicine People. Ancient ceremonies and traditions, intrinsic to our health care model are available.” The “Overview & History” page shares that Anishnawbe Health Resources was founded in 1984, based on the vision of Elder Joe Sylvester. What originally began as a diabetes project, expanded to encompass the needs of Aboriginal health care in Toronto using a model that is based on culture and traditions. Today the mission of Anishnawbe Health Toronto is “To improve the health and well-being of Aboriginal People in spirit, mind, emotion and body by providing Traditional Healing within a multi-disciplinary health care model.” I feel this is an important resource because it demonstrates for me how traditional Indigenous cultures, traditions, and knowledges can be integrated with the theories of western medicine to provide for the health and well-being of the Indigenous peoples of Canada. It emphasizes for me the fact that we need to integrate Indigenous knowledges into all aspects of Canadian society, not simply into our classrooms. 3. The following link is to a powerful, but often extremely painful selection of stories from survivors of residential schools in Canada. Each of the forty-seven stories on the site is told in the form of an interview. Each survivor has his or her own story, but there are common threads throughout many stories that include feelings of community and safety before they were taken away from their families to residential schools, fear and a lack of understanding when being taken to and arriving at residential schools, and of devastating trauma caused by the many different forms of abuse suffered while at residential schools. Each story demonstrates the profound impact of residential schools on Indigenous peoples and their families, and the continued impact on their lives today. Please note before you watch any of these videos that there is a warning on the “Stories” home page due to the painful and disturbing subject matter in many of the videos. A contact number is provided on the home page for the Health Canada 24-Hour National Survivors Crisis Line if needed. 4. The following link is to a CBC News, “As It Happens”, written article and audio episode reporting on the Truth and Reconciliation Commission summary report. The written summary provides information about the report and appeals for “a nation-wide commitment to reconciliation” as it exposes the abuse, deaths and continuing trauma suffered by those who were taken from their homes and forced to attend residential schools. The article includes a summary of key recommendations from the 381-page report. The audio is accessible by clicking on ‘Reconciliation is not an aboriginal problem, it is a Canadian problem. It involves all of us’ on the left side of the screen. In doing this, you will be able to listen to the entire “Truth and Reconciliation Commission summary report coverage” portion of the June 2, 2015 episode of “As It Happens” which is 15 minutes and 51 seconds in length. 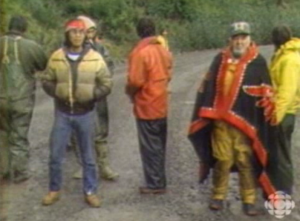 The episode includes much of the information given in the written article, as well as providing some of the testimonies from Residential School Survivors during the Truth and Reconciliation Commission. 5. My final link is to a TEDx video titled “Changing the way we see Native Americans” that I found created hope. I was immediately drawn to this TEDx TeachersCollege talk by the opening video of a young Indigenous child watching video images of Indigenous peoples as they are portrayed by Hollywood and other major media sources. When Matika Wilbur began to talk, I was drawn to her message as well as the good and beauty that seemed to emanate from her. Her TEDx talk centered on the modern and mainstream view of Native Americans, based on stereotypical images that are created through major media sources. Her goal is to change the way that Native Americans are perceived. With this in mind, she created a project in 2013 called Project 562 which “seeks to photograph every Federally recognized tribe in the United States and reveal in a brilliant spectrum of art, media, and curricula, the rich and complex twenty-first century image and reality of contemporary Native Americans.” During her talk, Matika Wilbur questions, “How can we expect mainstream support for sovereignty, self-determination, nation-building, tribally-controlled education, health care and jobs, when 90% of Americans only view people, my people, as one dimensional stereotypes situated in the historic past, or even worse situated in their imaginations. I argue that we can’t.” (time stamp: 11:38). Matika seeks to create positive change by identifying contemporary Indigenous role models, and to connect us together so that we can learn to respect and honour one another. 1. The link below is for the Reconciliation Canada website. The “About Us” section tells its audience that the idea around Reconciliation Canada was “born from the vision of Chief Dr. Robert Joseph, Gwawaenuk Elder.” Reconciliation Canada provides information and resources to help engage individuals, groups, and communities in discussions and experiences related to reconciliation with the purpose of “revitaliz(ing) the relationships among Indigenous peoples and all Canadians.” This website offers “Programs & Initiatives,” suggestions for how to “Get Involved,” “News & Events,” “Resources,” how to “Contact” them, and how to “Donate.” I found the resources section especially helpful from the perspective of an educator because it provides resources to access the topic of reconciliation from a variety of sources and instructional strategies, including videos, impact stories, useful links, shareable documents, and toolkits. 2. The next link is to an article in a chapter of a virtual textbook, AFMC Primer on Population Health. The section discusses the profound impact of colonization, specifically the impact of residential schools, loss of language and culture, and western values and laws forced on Indigenous populations in Canada, and the lasting health effects that are the consequence. In addition to this, the significant differences between Indigenous healing practices and western medicine, as well as the potential for integration of these two is touched on. 3. The following link is for the National Collaborating Centre for Aboriginal Health (NCCAH) which was established in 2005 by the Government of Canada and is one of six National Collaborating Centres for Public Health in Canada. The NCCAH is hosted by the University of Northern British Columbia (UNBC) “as part of its dedication to First Nations and Aboriginal programming” and is funded by the Public Health Agency of Canada. This overview is essentially a factsheet which provides a good overview of and statistical representation of First Nations, Inuit and Métis peoples in Canada. The overview touches on a number of significant issues affecting First Nations populations, and the information referenced in the overview is quite up-to-date with references as recent as 2013. 4. I found the next link interesting as it appeared to attempt to address the issue of developing early education opportunities for First Nations children, which seemed to connect well with the “Stepping Forward” video that we watched in Module 3 – Week 8. The website states, “the Government of Canada established Aboriginal Head Start to help enhance child development and school readiness of First Nations, Inuit and Métis children…” However, I believe this link could potentially act as an interesting debate piece. While the website asserts that the goal of the program “is to support early child development strategies that are designed and controlled by communities,” I question whether the governing body (in this case, the Government of Canada) will allow that development to be based around First Nations culture and language, or if western education strategies will actually be targeted through development/learning outcomes prescribed by the government. Interestingly, the programming outline lists “education” and “culture and language” as two separate components. 5. My final link is to a news article that connects directly to the issues shared on the “Stepping Forward” video watched in Module 3 – Week 8. While the article deals with a current issue and has only been published within the last few days, the issue itself brings the reader back to the days of residential schools. The article reveals that the government of Nunavut is investigating a report of at least one teacher threatening punishment and actually disciplining a student for speaking their language, Inuktitut, in school. The article discusses the fact that there are fewer than 200 Inuit teachers and over 400 non-Inuit teachers currently teaching in Nunavut, which contributes to the lack of language and cultural understanding in the territory. Indspire is a charity for Indigenous people by Indigenous people. When I worked with young ladies from the Kahnawake reserve in Montreal we attended a conference given by Indspire and it was something that none of us had ever experienced before. We had various speakers from various Aboriginal sectors speaking to the students their fields of study ranging from communications, to medicine, to the military. The speakers left the students motivated and inspired about their futures. Muskrat Magazine is an online magazine whose primary focus is on Indigenous arts and culture. The magazines focus is to exhibit original works of art in various forms and to engage in critical commentary. Muskrat magazine uses both rural and urban settings and uses media arts, wireless technology and the internet to distribute information in an eye opening and interesting manner. https://fasdprevention.wordpress.com/ is a blog created to increase awareness about Fetal Alcohol Spectrum Disorder. Since I am looking at social media use among Indigenous peoples, I am looking into what blogs are out there and what areas are these blogs in. Healthy and well-being, seem to one of the big concerns among indigenous peoples and many blogs seem to be appearing in these areas for individuals looking for help. http://www.naho.ca/radio: Radio Naho is a new initiative from the National Aboriginal Health Organization aimed to bring health issues to the masses from a holistic perspective. The goal is to educate individuals with an emphasis to be placed on prevention. This radio station is geared to youth and young adults and wants to educate and influence healthy behavior by bringing on experts, advocates and role models. An Index of Indigenous Podcasts this post found on Media Indegina website lists various podcasts created by Indigenous individuals. There is no secret that it can be hard to find Indigenous representation in podcasts but this list is start. 1) A common theme I have noticed when reading responses this past week has been around the lack of authentic resources available to educators to aid in the integration of First Nations principles in our school curriculums. The following provides a link to a publication of fnesc (First Nations Education Steering Committee) and FNSA (First Nations Schools Association) titled, Authentic First Peoples Resources: K-9. This resource was published in 2011, but was updated this year (2016). This is a lengthy publication that provides “Resource Annotations” detailing each resource in terms of title, author(s)/editor/compiler, illustrator(s), publisher, reading level, applicable curriculum areas, themes and topics, publication date and number of pages. In addition to this, the “Resource Annotations” chapter also provides a description, list of titles in the series (if applicable), and features of the text (i.e., text is in both English and Sm’algyax). There is also an “Index of Resources” (starts on p. 109) that gives a quicker summary of each resource including the title, nation(s), grade(s), resource topics and themes. My next four links are to resources that discuss the connection between culture, language and well-being in Indigenous populations. I am becoming increasingly interested in and concerned with the profound impact that the loss of culture and language is continuing to have on the health and well-being of Indigenous populations. Studies, like the one by Oster et al. (2014) referenced below, have shown that “the intergenerational effects of colonization continue to impact the culture, which undermines the sense of self-determination, and contributes to diabetes and ill health.” My focus is around how we, as educators, can begin to help First Nations children and youth reconnect with culture and language, in hopes of increasing connections, but at the same time decreasing the intimidation and alienation (O’Sullivan, 2013) felt in Indigenous communities. 2) McIvor, Napoleon, and Dickie (2009) report that there is an increasing amount of evidence showing that the continuity of language and culture in Aboriginal communities contributes positively to the health and well-being of Aboriginal people. However, the loss of culture and language due to colonization has had, and continues to have, a profoundly negative impact on the health and well-being of the Aboriginal population. McIvor et al. report that “all indigenous languages in Canada are seriously endangered and most are at risk of extinction (Brittain, 2002; Shaw, 2001; Standing Committee on Aboriginal Affairs, 1990)” and “in the last 100 years alone, at least ten of Canada’s Aboriginal languages have become extinct (Norris, 1998).” Through their research, McIvor et al., found that there is hope in the form of “protective factors” to combat identified health issues, and that there is evidence that the use of languages and cultures contributes positively to the health and well-being of Aboriginal populations. The six themes that emerged were: land and health, traditional medicine, spirituality, traditional foods, traditional activities and language. 3) O’Sullivan’s (2013) article discusses issues around providing “culturally competent care” and a “culturally safe environment” for Aboriginal patients in our Canadian health care system. The article draws attention to the fact that many Aboriginal people “tend to avoid seeking medical care because of factors such as negative stereotypes and lingering racism.” O’Sullivan points out that health care professionals must be educated about cultural differences that exist, rather than assuming that all patients have the same basic needs and perspectives. Acknowledging Aboriginal knowledges and traditions, as well as showing empathy and respect, is essential in creating a safe and accepting environment for Aboriginal patients. 5) Jewell’s (2016) quantitative study provides an interesting analysis of data regarding the exposure and acceptance of Aboriginal languages in urban settings in Canada. Jewell discusses the fact that Indigenous languages are endangered, but that revitalization efforts are in effect in many communities. Jewell discusses the importance of language in the continuity of culture, as well as the effect of continuity of language and culture on the health and well-being of Indigenous people. Jewell draws attention to the fact that while an increasing number of Indigenous people have been moving to urban settings, the majority of language revitalization programs remain on-reserves (Baloy, 2011, as cited by Jewell), although language programs off-reserve are increasing. Jewell concludes that when there is exposure to Indigenous languages both inside and outside the home, an increased value is placed on the language. Jewell’s hope is that with increased value will come increased study, interest, and advocacy. After watching the video with Dr. Lee Brown, I thought I would explore more information about the idea of emotional education as well as Dr. Brown, himself. Through the UBC website, I found a bio as well as a presentation on Emotional Competency and Its Effects on Health. Once you open the website, click on the Download Presentation Notes link towards the bottom of the webpage. This presentation begins with a historical look into the world of emotions. From Aristotle to John Locke, Dr. Brown explores man’s evolution of thought. He then moves into a discussion about how our ability to be emotionally aware (competent) can add to our longevity and general well-being. There is great information within this presentation which provides further insight into his online video discussion this week, including the Principles of Emotional Communication which would assist any teacher in any classroom. I’ve included this site because I know from my own experience working with native people (along side native interpreters at Fort William Historical Park) that stories play a key part in the cultural narrative of native peoples (Ojibwa in my case). This site takes people’s personal stories of healing and transfers them into a digital medium which allows them to share their experiences with a much wider audience. This is a powerful tool because their unique perspective can be shared with others and perhaps help them with situations in their own life.